Each Fall, in conjunction with the regular financial stewardship appeal, an Annual Report is created and distributed to highlight just a few ways parishioners' financial gifts are being used to fulfill the mission of discipleship. It serves as a reminder that the resources given to the parish are a spiritual tool. They are on loan from God and are best when returned, as an exercise of love, back to God. This return is offered for and through the mission of the Church, lived in parishes. Christ King Parish continues to grow more vibrant, focused, and faithful to her mission. And this is being done more prudently than ever, as parishioners' gifts are being used efficiently and effectively. 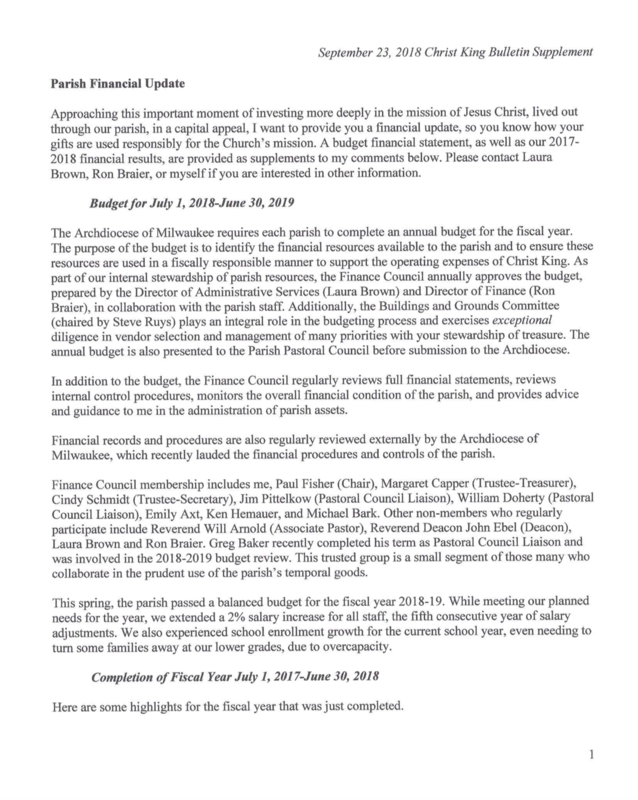 Over the past five years, the Pastors, Pastoral and Finance Councils, Buildings and Grounds Committee, and staff have worked diligently to be good stewards of these financial gifts. They have done their very best to maintain our beautiful church, school and campus. Along with that however, has come a growing recognition of the need for a deeper level of investment, above and beyond the usual annual giving, to properly address the growing repair and replacement issues in our eighty year old household. After much contemplation, focus group meetings, professional recommendations and examinations, a case statement was developed and strong support was evident for a Fall 2018 capital appeal. Click HERE to find detailed information on the capital appeal financial goals, campus items and spaces earmarked for repair or replacement and the formation programs and ministries that will be positively impacted. This detailed information will serve as our annual report for 2018.